Everybody’s favorite oversized gorilla is back for his eighth feature in Kong: Skull Island, a monster movie that’s lacking worthwhile characters and a plausible plotline but still delivers the goods with some excellent effects-driven sequences. Like just about everything else these days, one of this primary film’s goals is to set up a franchise –in this case, the Warner Bros/Legendary “MonsterVerse” that began with the glum 2014 remake Godzilla— but Skull Island does have enough unique touches to distinguish itself from other brain-dead reboots. Though its 1970s setting is meant to inspire comparisons to the Vietnam War and the subsequent war movies that were based on it, this is actually more of a throwback to the creature features of the 1950s that threw loads of terrifying creations onto the screen just to see what would stick. After a prologue set during World War II, we move forward to 1973 as government official Bill Randa (John Goodman) recruits a crew to substantiate his suspicions that an uncharted island may be home to ancient beings of massive proportions. Along for the ride is British tracker James Conrad (Tom Hiddleston) and photojournalist Mason Weaver (Brie Larson), in addition to US colonel Preston Packard (Samuel L. Jackson) and his helicopter squadron. After dropping a heavy arsenal of explosives to “test for seismic activity”, the explorers are introduced to the gigantic ape Kong as he annihilates their air attack and leaves the surviving parties stranded on various parts of the island. Besides setting the movie during such an evocative time period in American history, another key decision that director Jordan Vogt-Roberts makes when retelling this story is how early in its runtime he chooses to reveal his central monster. Where other directors have kept creatures like Jaws and Godzilla under the surface or obscured in some way, Vogt-Roberts knows the audience is there to see Kong do his thing and its no surprise that his first scene is the film’s highlight. In fact, the first 20-30 minutes are so clumsy in their attempt to flesh out the characters and their motivations that I almost wish we could have arrived at Skull Island even sooner. For better or worse, the movie’s most sympathetic and enjoyable character isn’t a part of the initial band of visitors but is an eccentric resident of the island played by John C. Reilly who pops up about halfway through the story. Not only does he possess much needed wisdom about the mysterious land and the way of its creatures, he also has a wacky affability and the kind of goofy charm that Reilly has perfected throughout his career. During his initial encounter with Conrad and Weaver, he clues them in to the worst monsters on the island that he has dubbed “Skullcrawlers” because, well, the name “sounded neat” to him. 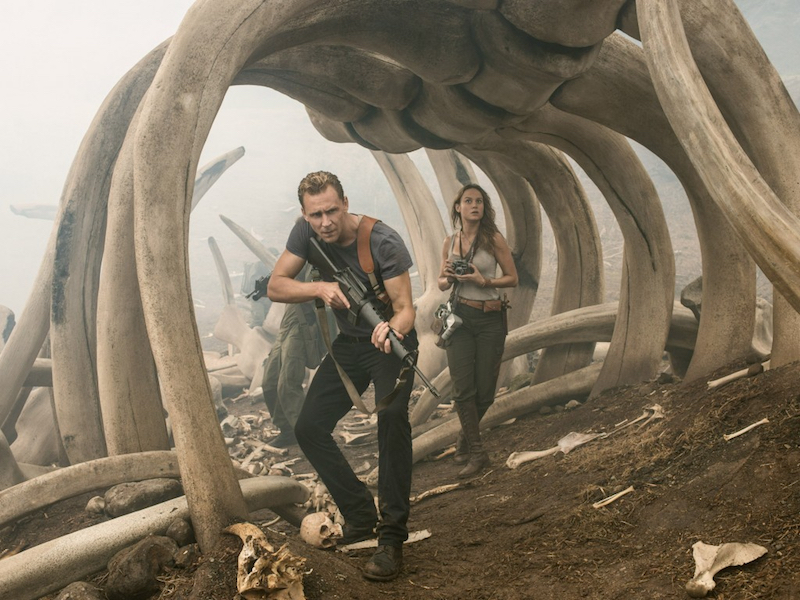 To its credit, Skull Island moves briskly from one creepy monster to the next but contrivances that keep our protagonists stranded on the titular island begin to pile up in ways likely to irk even those who say they don’t care about plot in monster movies. A certain character’s descent into madness (yes, this movie owes quite a bit to Apocalypse Now) begins to hijack the narrative about two-thirds of the way through and makes the concept of computer-generated behemoths brawling seem credible when compared to the overwhelmingly stupid decisions made by the humans. As a showcase for some jaw-dropping special effects, Kong is undeniably effective but it could have been much more memorable with some tighter screenwriting and attention to character.